This holiday house is composed of two separate apartments and a garden ,pool and 4 parking spaces . It is rented exclusively as a whole house and only intended for single use. In total of 5 bedrooms 10 to 14 people can be accommodated. The house is located in village Kosici, 5 km distanced from Krk town. 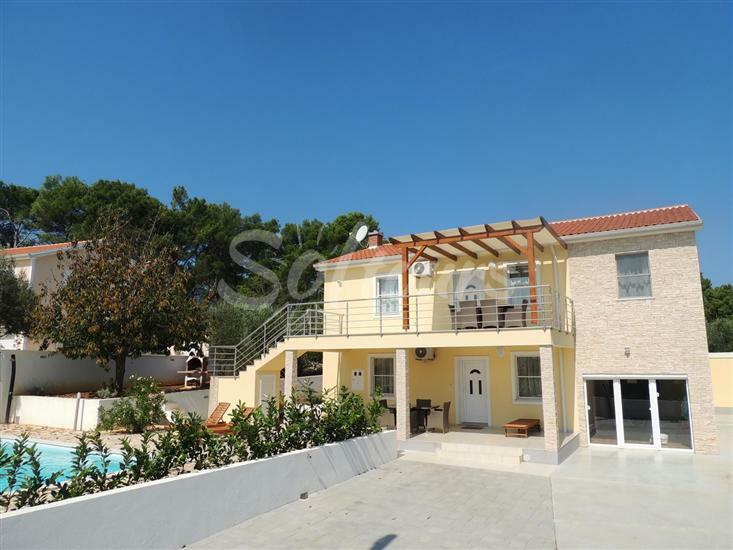 It has a plot of approximately 700sqm with a closed courtyard . In front of the house there is a pool , comfortable and spacious terrace with a very beautiful view which also offers plenty of rest and relaxation. House is spacious and gives a feeling of freedom . On the ground floor there's an apartment with large living room and kitchen. In living room there is also a satellite TV and a further dining table. There is also a relax room with utilze room with dishwasher. Apartment has 2 bedrooms and bathroom with tub and shower. With external stairs it is connected with first floor with beautiful terrace and another apartment with 3 bedrooms . All three rooms are furnished with double beds and in two of these three , there is possibility to set up a further extra bed . These three rooms share a large bathroom with tub , toilet and shower. 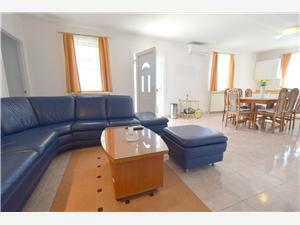 This apartment also has a fully equipped kitchen with dining room and living room. Both apartments have air conditioning, central heating, WiFi Internet and DVD - player . In front of the house , as you can see on photos, is a swimming pool with outdoor shower and barbecue . Both terraces are equipped with garden / terraces furniture . You can park right in the closed yard . Pool as well as complete device is of course only for our guests. Pets are allowed.